Have a dream about setting up your very own joint on Blake Street? 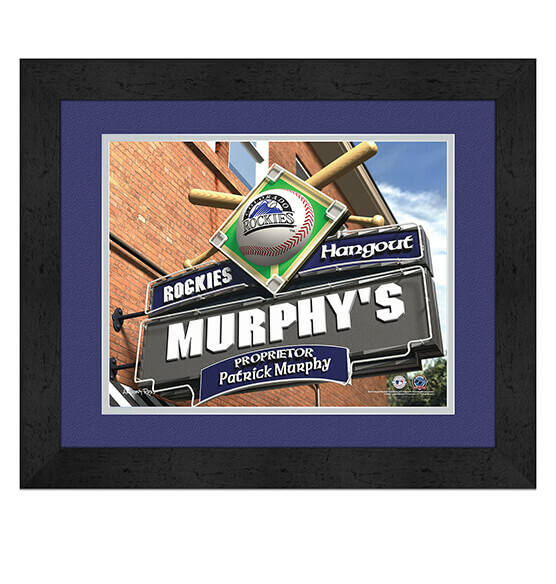 Now's your chance with our Colorado Rockies Personalized MLB Pub Sign Wall decor. Whether you purchase this custom sports decor for yourself or give it to the most devoted Rocks fan in your life, you can't go wrong with this high-quality MDF vinyl-wrapped frame. Our made-to-order print will brighten any Colorado Rockies fan zone with its use of official Rocks colors, team logo and more! You can easily customize this by specifying the first name, last name or nickname you want to use, and we will do the rest. Your personalized pub sign arrives ready to hang in your home or office.